You can not start early enough to get acquainted with the IF, ELSE and SWITCH-with-set. The main advantages is that we will not sit in front of a screen and has a board that alone can not play, so its promotes socialization. The game takes place in a ski resort where 2-4 players must quickly get through the IF and ELSE WHILE loops constructed of branches and logical slalom átszakítani the finish line first. Discover the fundamentals of computer programming by playing a board game! 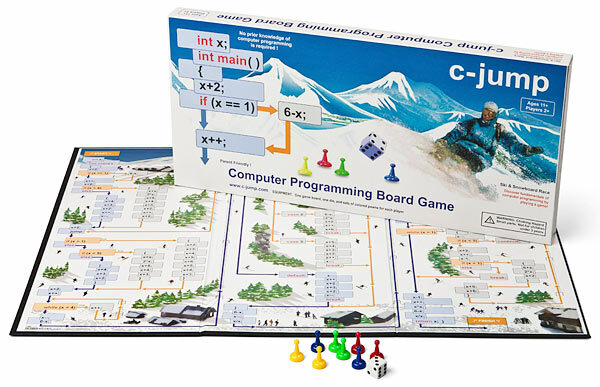 c-jump helps children to learn basics of programming languages, such as C, C++ and Java. The game teaches basic commands of a programming language, such as “if”, “else”, “switch”, and introduces variable “x” concept. Skiers and snowboarders line up at the start location and race along the ski trails. Spaces on the board show statements of programming language. First player to move all skiers past the finish line is the winner. The child calculates number of steps in the move, including addition, subtraction, division, and multiplication of small numbers. The game helps to develop understanding of a complete computer program, formed by logical sequences of commands. This game eliminates intimidation of many kids and their parents, bored by the mention of “computer programming”, often associated with visions of geeky guys glued to their computers. c-jump reveals simple programming terms in a cool way! C-jump does not aim to emulate the work of C or Java compiler, which interprets every statement in a program. C-jump gives players an ability to learn bits of programming by looking at the existing code and making decisions about the outcome of particular statements. Playing with multiple pieces enhances such experience, as players can choose a better alternative.